Meet Your Next Favorite Bike For those in search of a dual-sport that delivers both function and all-around fun, the CRF®250L stands apart from the rest. It has all the features you love in an off-roader, like the upright seating position, long-travel suspension, and distinct styling cues. And when you take a bike like that out on the street, you’re in for a good time. The CRF250L also delivers on the practical side. It’s a fuel miser, getting an estimated 73 miles per gallon. The user-friendly powerband is ideally suited to navigating city streets. And the low-end torque comes in handy on trails and in traffic. 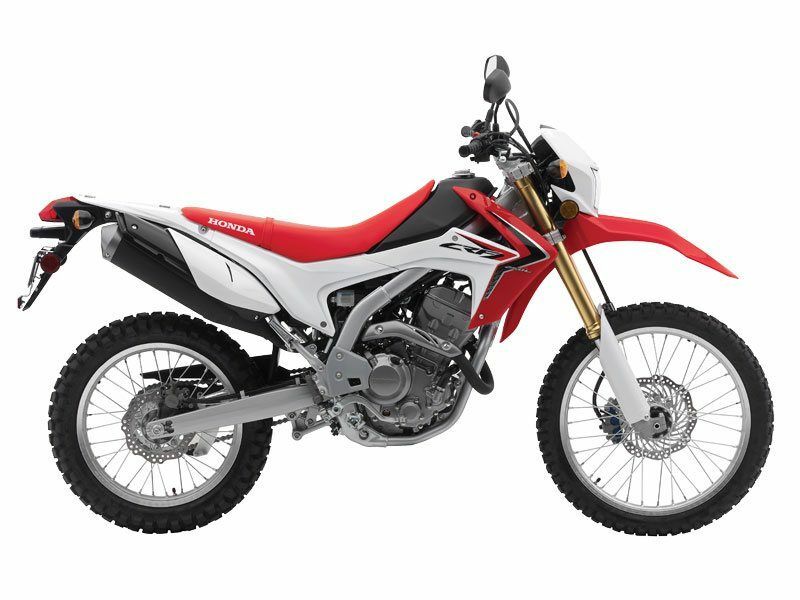 So if you want a bike that delivers the best of both worlds, look no further than the 2014 CRF250L. Versatility is what the CRF250L is all about. And that comes right down to the tires. With a 21-inch front and 18-inch rear wheel, you have plenty of tire choices, for serious off-roading or smooth, on-road touring. Sometimes you need to take a little something along for the ride. So we gave the CRF250L cargo hooks to help you secure a load with bungee cords, without scratching the bodywork. And on the left side, you’ll also find a small, secure storage box. With a long, motocross-style seat, you can move forward and back, left and right with ease, helping you navigate changing terrain in comfort. Mounted in the headlight visor, you’ll find all the information you need in a clear, digital readout: speedometer, clock, fuel gauge, twin tripmeter and more. Front and rear hydraulic discs give the CRF250L predictable brake feel and stellar stopping power for both on- and off-road riding. We equipped our 250cc single with a counterblancer. That way, you get the power advantages of a single, with smoothness of a multi-cylinder engine. All in a lean package. Our Programmed Fuel Injection means your CRF250L will start right up, even on cold mornings. And it has the additional benefit of reducing emissions while improving performance and fuel economy. The stellar handling of the CRF250L is in part thanks to an inverted Showa fork, complete with large, 43mm sliders. It all helps you navigate traffic and trails with confidence. The long seat and fold-up, frame-mounted footpegs means the CRF250L is ready to take a passenger along for the ride. Thanks to our single-shock Pro-Link rear suspension, the CRF250L delivers excellent comfort, traction and handling, while also improving rider confidence. Equipping the CRF250L with a single just makes sense. It keeps the bike light while delivering excellent power, torque and fuel economy. Potholes and gnarly trails are no match for our steel frame. It’s engineered strong, able to withstand the punishment of real-world riding. 73 MPG - Honda's fuel economy estimates are based on EPA exhaust emission measurement test procedures and are intended for comparison purposes only. Your actual mileage will vary depending on how you ride, how you maintain your vehicle, weather, road conditions, tire pressure, installation of accessories, cargo, rider and passenger weight, and other factors. One Year	Transferable, unlimited mileage limited warranty; extended coverage available with a Honda Protection Plan.